Yesterday was my husband's birthday, and rumor has it that it was one of those round number ones. Instead of cake, I decided to make him his very favorite dessert: vanilla ice cream. 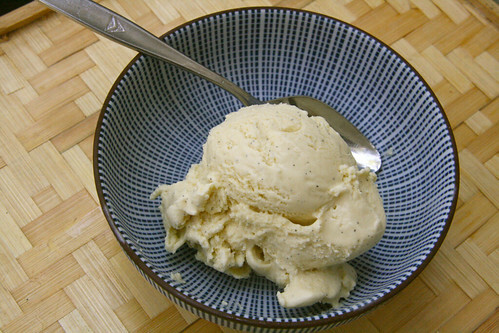 I've made many different vanilla ice cream recipes, and wanted this one to be something special, so I turned to Fine Cooking's Double Vanilla Bourbon Ice Cream. I had actually bought the June 2009 issue of Fine Cooking magazine because of the ice cream article featuring David Lebovitz ice cream creations, including this recipe. But I forgot about it until my friend Di of Di's Kitchen Notebook mentioned that she made this ice cream recently (I don't think she's blogged it yet, though). I knew it would be perfect for my husband's birthday. - You can find the recipe in Fine Cooking, here. - I made 3/4 recipe. - I used a "bourbon" variety of vanilla bean, which sounded appropriate for this recipe. I ordered the vanilla beans here. - For the bourbon, I dipped into my husband's bottle of Maker's Mark, which has been gathering dust carefully saved for lo, these many years. This was a delicious version of my husband's favorite ice cream flavor. It had plenty of vanilla punch, and the hint of bourbon added another flavor dimension. Everyone in the family enjoyed this birthday ice cream treat. Looks great Nancy! I always love seeing the specks of vanilla in treats, and they're so beautiful in your ice cream. This one was already on my to-do list after Di mentioned it, and now you've reinforced that I should definitely get on it. This is a yummy one, isn't it? I'm using some for my mini TWD tart. Hopefully I'll manage to get it posted some time tomorrow. Glad to hear that you all liked it. Ooh....I have to try beanilla...everyone has been talking about it. Happy Birthday to your husband! Happy Birthday again to J! I saw on JDE's blog that he was "40"...you married a younger man, you cougar you!! ;-) The ice cream looks delicious. Happy belated birthday. An excellent way to celebrate with one of David's winning recipes. This is the blogging equivalent of Dog at my Homework :). Great post.